We’re back and we’re in high def! Everything is prettier! Got my capture software sorted – it’s a lot harder than you think to get good capture software that will do fullscreen games at 60 fps without slowing down. 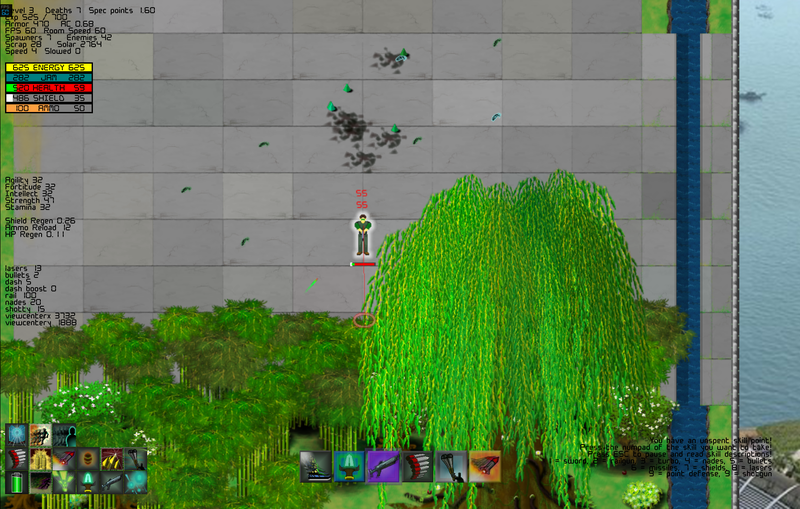 Put huge work into art assets and visuals: updated explosions, shrapnel physics, new plantlife, apple trees (that drop apples yay! ), targeting, UI font, smoke trails, all kinds of stuff! Here you can see the leaves moving up the tree as your view moves down past it. 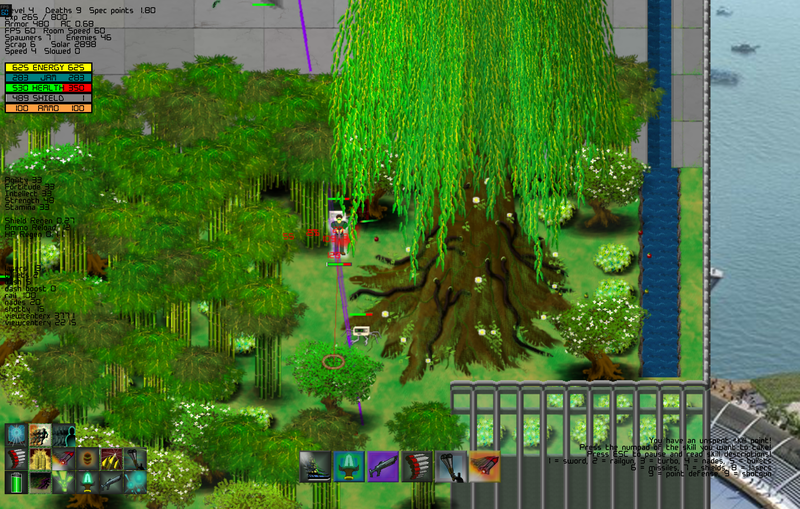 The trees and bamboo are randomized as far as their right or left orientation, color balance, height and width and what kind of fruit they drop. This means that I can outfit environments with very few unique objects but still get that resulting diversified look. This will be one of my main techniques for environment building as I continue to add new assets. As far as gameplay is concerned I’ve cleaned up the movement a lot to avoid getting stuck on walls and I’m quite pleased with it’s current implementation. On that note I added a dash move that has no resource costs and a small cooldown that you can activate when double tapping a direction on the keyboard. Quite handy for times when you’re out of energy or jam and you need to evade. 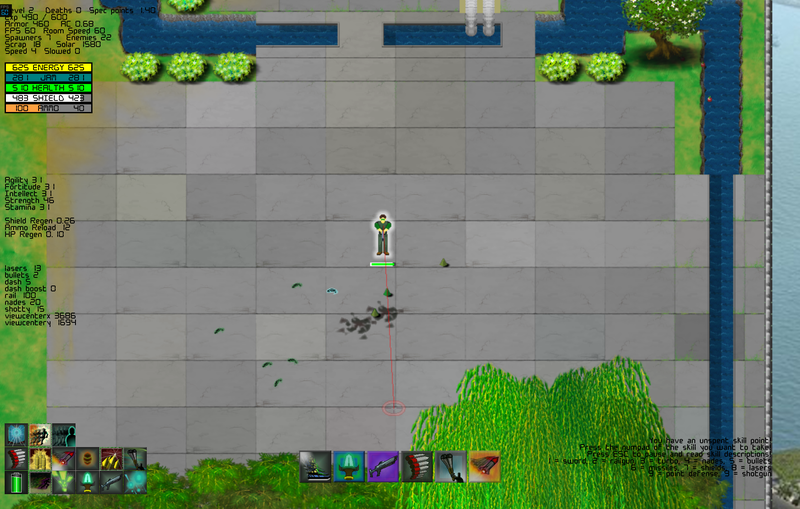 Also implemented what I’m calling ‘Aspects’, Currently there are just two, a defensive melee one and a ranged dps one, you toggle between them with the ‘Z’ button and it makes a sound and changes the color of your character aura. So far really fun flipping between them according to the situation. Ok well that covers enough bases for now. Back to the grindstone!